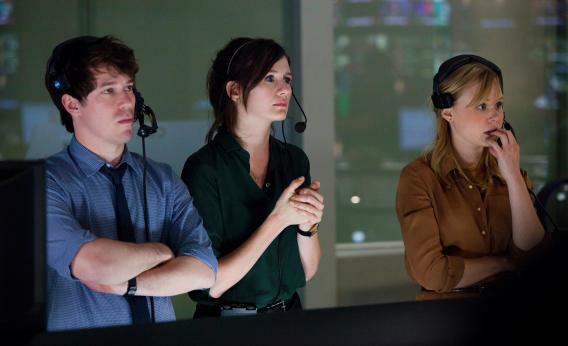 Why Aaron Sorkin's woman problem makes The Newsroom so boring. The twin foundations of the series are that men commit acts of brave journalism and women help them do that, and that any number of attractive women find the pompous Will attractive enough to date (or in MacKenzie’s case, obsess over). It kind of makes my blood boil that Sorkin refers to Preston Sturges and classic film comedies when talking to the press about this show, but Rosalind Russell’s character in His Girl Friday is one of the best parts of that great, great movie. She’s got her own agenda, she’s flawed but powerful, she’s funny, she’s independent and she’s nobody’s fool. I think Sorkin thinks he’s recreating that kind of dynamic in various aspects of The Newsroom—in the dialogue, in the relationships between the men and the women—but the alarming gap between what he believes he’s doing and what I actually see on the screen grows wider with eachepisode. When you’ve got a setup where women exist to serve men’s needs, as they do in The Newsroom, you don’t just end up with the kind of sexist mess that Sorkin has here, where women are neurotic, tech-incompetent emotional morons who snap into professionalism just in time to make the men they bolster look good. Sorkin’s imposed an unnecessary, perhaps crippling, dramatic limitation on himself. Whatever MacKenzie and Maggie (a woefully-served Alison Pill) do in the course of the series, it can only reflect on the men they interact with, not back on them. MacKenzie’s hysteria in the most recent episode, kicked off when she accidentally emails the whole company to tell them that she cheated on Will rather than the other way around, is all about Will, about how much she wants his approval, what a saint she insists he is, that she’s done him wrong yet again. In an upcoming episode, when Maggie has a panic attack, the incident becomes a chance not to explore the root of her anxieties, but to provide her colleague Jim (John Gallagher Jr.) a chance to whip out the treatment skills he picked up during his time as a war correspondent. No matter how into his own dudeliness Sorkin is, that’s a lot of dramatic territory to give up. I’m not one to say that prestige cable dramas have done well by women over the past decade, given their overwhelming obsession with middle-aged white men and their deviance. But most of the good ones had at least a passing interest in the inner lives of the women in those middle-aged men’s lives. When Carmela Soprano struggled with whether or not to leave Tony, what mattered was how morally compromised she’d become, not how fascinating and admirable her mobster husband was. On The Wire, Kima Greggs’ experiences as a lesbian cop mattered not because they somehow rebounded to the credit of her commanding officer, Lieutenant Cedric Daniels, but because they told the audience something about what it took to do police work in Baltimore. Even Kurt Sutter, the creator of FX’s Sons of Anarchy, a show about a hypermasculine biker gang, is clearly fascinated by the women who are affiliated with the motorcycle club, and the specific ways they are vulnerable to becoming collateral damage in the club’s schemes. It’s so disappointing, then, that The Newsroom seems so bored by its female characters, especially given its subjectl. It’s a show that will namecheck sports reporter Erin Andrews as one of Will’s girlfriends, but has no interest in drawing on the experiences of female war correspondents, from Lara Logan to Marie Colvin, to inform MacKenzie’s character. She was apparently more affected by her breakup with Will than anything she covered in her highly-touted time in war zones. At a moment when there are vigorous discussions about the byline gap and how to encourage young female journalists to cover hard news, Maggie’s character could be an opportunity to explore the choices women face as they’re pursuing media careers. Instead, the show mocked her the only time she brought up questions of work-life balance and the possibility that she’s perceived as a lightweight by her colleagues. All of these issues would make a terrific, serious television show about the future of the news. But Sorkin keeps peering back through the mists of the past to commune with the ghosts of morally upstanding men, rather than contending with flesh and blood women.